JOIN US FOR MORE FUN AT THE MALL! 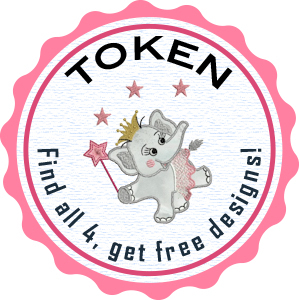 Start hunting now for the Designers of the Week Tokens and get FREE DESIGNS! Directions below. Every Friday, we feature four new fantastic designers as Designers Of The Week. The links to their stores are at the top of the CURRENT SPECIALS page and the DESIGNERS page. Start on one of these pages. Click one of the Designer of the Week thumbnails. This takes you to the index page of the Designer's Store. Each of the thumbnails on the index page leads to either a collection page or singles page. Click the index page thumbnails, then look through the linked pages. If you don't see the Token on a page, then click the back button and repeat the process until you find the Token in the featured designer's store. Then go back to the current specials or designers page and repeat the process. Find all four tokens for the week and you get a FREE SAMPLER of 8 designs! The Samplers are usually available as a "with purchase bonuses", but you can choose one absolutely free when you find all four tokens for the week! As you find the tokens, down the names and addresses of the pages you find them on. Then send us the names/addresses plus the name of the sampler you want by using the CONTACT US form. Check back every week! New Designers of the Week and Bonus Tokens are added every Friday!